The Yard restaurant boasts a superb international menu served in a contemporary setting. Those looking for something even more elegant will enjoy The Champagne Bar; a stunning retreat with outdoor seating which makes for the perfect end to the day. As well as the indoor heated pool and fully equipped fitness centre, the spa has a sauna, steam room, snail shower and ice fountain. There are seven fully-equipped meeting rooms, the largest of which can welcome up to 600 guests. 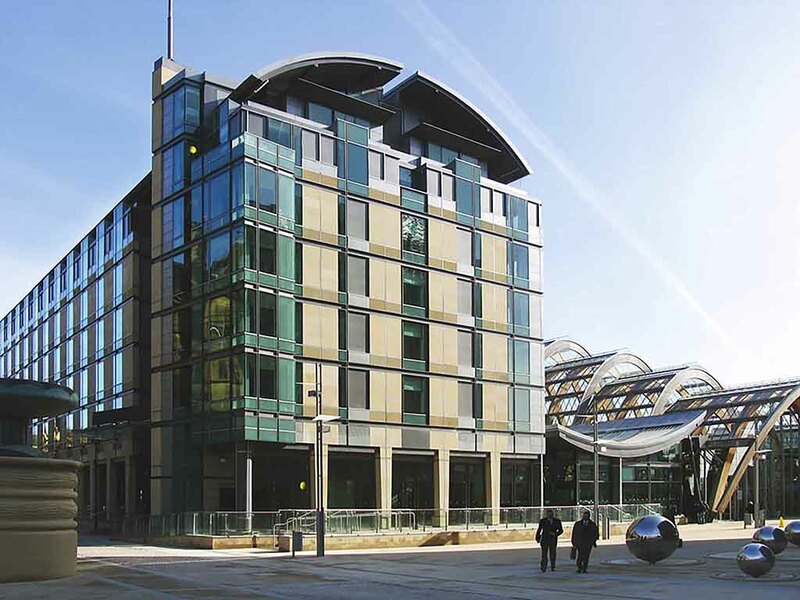 Located in the heart of Sheffield, the hotel is easily accessible via most major transport links. Guests travelling by road should exit the M1 at J33 and follow the signs to Sheffield. Both Sheffield station and airport are also in close proximity. With 163 bedrooms, guests are offered a range of accommodation options including privilege rooms, spacious suites, interconnecting rooms and enhanced accessibility. Each room features a range of facilities such as air conditioning, WiFi and satellite TV. Every bedroom is in line with 4-star standards but some suites offer particularly inspiring views over the city, designed with panoramic windows so guests can enjoy and absorb every detail. The Yard at St. Pauls adds more variety to your meal, offering contemporary British cuisine including quality steaks as well as the freshest and most beautifully prepared fish and seafood delicacies. The Champagne Bar @ St. Paul's is the perfect setting and is certain to become one of the city's most desirable meeting places. A stylish coffee bar adds an inviting retreat for shoppers and anyone wanting to take time out from a hectic day. The room was beautiful, the evening meals and breakfast great - awesome and polite service from the staff. The room was clean and tidy. However check in was slow, with staff pleasant once they responded but dealing with other things despite a building queue of paying guests. Reception area was cold particularly in the morning. I guessed the air conditioning was set high despite a cold day outside. Overall disappointed in view of the price paid. Staff were very friendly and helpful, but the first room I was allocated had such a strong smell of chemicals it was terrible, and the aircon was not working either. I had to move rooms. The next morning I wanted a Starbucks coffee and they couldn't find a cup with lid that fitted! Rank Group recommends this hotel for visiting executives but I was disappointed. Good sized room with comfortable bed. large bathroom with separate shower and bath. Very clean and modern hotel with friendly polite staff only let down by 2 receptionists referring to me as 'sir' though the one at checkout did correct herself immediately. Breakfast was good as was the meal I had later in the evening. A couple of niggles though, the supplied cable to plug audio player into the tv was broken and the wifi was dire; best speed at 1.8mbps but down to 0.35mbps at times, mostly only 0.7mbps. If you need wifi internet access this hotel may not be the best option. I have stayed at the hotel previously so knew what to expect however when we arrived there was a dreadful drain like smell in the reception and bar area. I had booked a twin and was given a double room there was a half filled bottle of water left in the fridge so we dint have any water tea and coffee had not been filled up so again no drinks Other than that the room was very basic but relatively clean . Fairly comfortable though rather too expensive. The hotel is extremely convenient if staying in Sheffield for the Sheffield Half Marathon, and is fairly comfortable with a pleasant open plan public area. However at well over £200 for one night it is simply over priced. Crap Wifi. broken lift (4th floor). bad house keeping (don’t replace used toiletries or laundry bags). Uncomfortable bed and sparse room. No water bottles in room. Late night street noise. Booked privileged given a non-privileged room - assured it was right room type despite all evidence to contrary that it was not. Eventually changed to room type i had booked. Funny they were trying to get people to upgrade for a fee when i first arrived. Difference v clear between room types. Still towels mean. Poorly stocked - no water. Enjoyed an overnight stay at the hotel. The room was spacious and clean. The hotel reception was modern and the location of the hotel was great. I'd booked my partner a treatment in the spa which she enjoyed but the spa itself needs to some TLC and also to be kept on top of during the day. One facility was out of order and there was a constant knocking on the steam room. There were slippers, towels, cups and even a apple core left throughout the spa. Each chair and bed at one stage had towels on and this didn't tie up with the amount of people in the spa. Also an elderly gentleman wearing a thong was quiet off putting. This was not an relaxing experience as had envisions of. Had a great stay over for a special wedding party. Really enjoyed our stay. Our room was lovely and clean, really spacious and the added extras like free cold drinks and access to the spa is great. Our only downside would be there was only one complimentary robe in our room and there wasnt a mirror next to a plug socket making it awkward to get ready. Other than that we had a great stay and would definitely recommend it. Clean comfortable rooms and friendly staff. The wifi however is incredibly slow and if you are looking to work on it then forget it. Excellent hotel, staff extremely efficient, clean, tidy, relaxing and facilities were great at no extra charge.